Evictions, rent increases, and developer tax breaks — when it comes to the housing crisis it is hard to see where the parties truly differ. “Every day that the Liberals delay allowing a new government to be formed,” said NDP’s Spencer Chandra Herbert earlier this month, “is a day that more people lose their homes.” With today’s vote of non-confidence, a feeling of optimism is now in the air. But will an NDP-Green government actually address homelessness? Will it fund non-market housing or even minimally alter the rules of the housing market? The new joint four-year agreement signed between the Greens and NDP makes no mention of spending aimed at homelessness or social housing, which means that the key document guiding a new NDP-Green government on housing will remain the 2017 BC NDP platform. So what exactly is in the platform? While the entire NDP platform unsurprisingly falls short of a Corbyn-style break with neoliberalism, the most underwhelming aspect of the document is its housing program. The platform carries key planks over from previous campaigns, and like the BC Liberals, the 2017 NDP program refuses to tax the rich. Without a genuine source of tax funding and without a plan to intervene into the free market, the NDP-Greens are poised to offer BC a kind of Vision Vancouver 2.0. This means zero social housing targets and no meaningful commitment to rent control. Instead, limited tax dollars will be used to subsidize landlords, homeownership grants, and private developers. When it comes to housing and homelessness, the accepted wisdom is that the NDP is more progressive than the Liberals. Yet a closer look at the New Democrats’ housing platform reveals that the two parties are aligned on most points. The most attention-getting pledge in the recent NDP campaign was a promise to build 114,000 units of housing across British Columbia over ten years. However, the plan provides no definition of the breakdown between market rental units, co-ops, social housing, and homeownership (called “housing for purchase” and “owner-purchase” in the platform). Vancouverites have seen this type of subterfuge before at the local level. By merging market and non-market housing into a single vague policy, and by relying mainly on a strategy of “supply stimulus” and tax breaks (“incentives”) for the private development industry, the NDP has in effect adopted the same policy model as Vision Vancouver. Provincial NDP leaders have long endorsed Vision’s STIR/Rental 100 program, which gives tax breaks to developers in exchange for market housing. 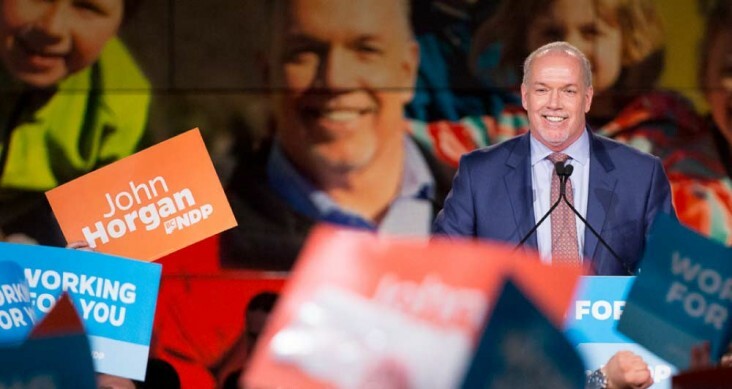 “Gregor [Roberton] is speaking up for renters,” said John Horgan recently, echoing the federal NDP which has also chimed in favor of more developer tax breaks. So far, Vision’s program has transferred millions of dollars to developers (well over half a billion) without achieving any minimal level of affordability. One of the problems with the NDP’s revamping of this market-based plan, as critics have already pointed out, is that 14,000 homes are already built each year in the Lower Mainland alone. Horgan’s idea, following Vision’s precedent, is to proclaim this market activity as “new” NDP housing. While these numbers might look good on a press release, they won’t change the tide of the housing crisis. More important is the lack of genuine funds for housing due to the NDP’s austerity agenda and harsh neoliberal low-tax approach to governance. What this means is that even if a minimal amount of social housing is smuggled into the ten-year plan, the platform lacks the resources to actually fund it. But perhaps all of this is a moot point, because the New Democrats have made it clear that the type of housing doesn’t fundamentally matter. As NDP’s housing critic David Eby said during the campaign: “What we need is to increase our affordable housing supply, it doesn’t matter whether it’s affordable housing for purchase or whether it’s co-op or whether it’s rental apartments.” The problem with this is that the rental market is already red hot, and has been for years. Increased supply has not created affordability, and for a simple reason: developers have used tax cuts to inflate their profits, not to bring down their unregulated housing prices. What we need in BC is not deeper tax cuts for a booming market, but instead new affordable supply and actual rent control. Is real rent control off the table? While the NDP housing platform does contain some minor proposals for amending the Residential Tenancy Act (RTA), their proposed measures don’t go nearly far enough to stem the tide of homelessness and housing inequality. For instance, the NDP says it will address fixed term leases and the geographic rent increase provision, two loopholes that have allowed landlords to evade the already scant rent control afforded by the RTA. Yet other loopholes, like the RTA provision that allows landlords to evict tenants for major renovations (“renovictions”), are seriously overlooked. Instead of pledging to get rid of the renoviction loophole, the NDP calls vaguely for “fair treatment during renovations and demolitions of rental properties.” Section 49(6)(b) of the RTA legally empowers landlords to evict tenants at any point during a tenancy for the purpose of gaining vacant possession to undertake renovations. Why won’t the NDP take direct aim at this provision? Their platform pledges to “protect good landlords,” but in reality, all landlords will be helped by a mandate that falls way too short. When BC’s housing crisis continues to produce rent hikes, mass homelessness, and evictions on a daily basis, the obvious measure needed in this province is actual rent control tied to the unit instead of the tenant. Yet the NDP has made clear that this solution is off the table. Attaching the RTA’s rent control provisions to rental units rather than to tenancy agreements (and to vulnerable tenants themselves) is a measure that housing advocates have been calling for for years. This single straightforward amendment would remove legal and financial incentives for landlords to evict tenants, while ensuring that RTA caps on rent increases could actually be enforced. Another solution that the NDP have proposed draws on BC Housing’s recent rent supplement model, in the form of a $400 renter credit. The rent supplement model was introduced by the BC Liberals as a pro-market alternative to social housing under Christy Clark’s government. Without actual rent control, this money will go directly into private market and into the pockets of landlords and developers, just as it did under Ronald Reagan who first created the policy in the 1980s. This is not an actual means to address the underlying causes of the rental crisis, nor is it enough money to compensate for the monthly costs of rent gouging in BC: the average cost of renting in Vancouver, for instance, is $1,900. The credit does nothing to address evictions, skyrocketing rent, and renovictions. Another basic problem is that the financially small renter credit will absorb a large portion of the proposed housing budget, leaving little money for social housing once the developers are paid out through tax “incentives.” To give a sense of how little the NDP are planning to spend on housing, it will be roughly the same amount of money spent on removing tolls from the Port Mann and Golden Ears bridges over the next four years. Like everywhere else in their platform, the NDP are most comfortable in adopting the BC Liberals’ own policy book. As mentioned, the ruling party has gradually been shifting from social housing to small rent subsidies for low-income renters. The NDP’s housing platform is guided by their commitment to property owners’ interests. This is reflected in its refusal to support a progressive taxation system for municipalities. Currently the province enforces a flat tax system for cities, but as the Canadian Centre for Policy Alternatives has pointed out, a progressive tax on high-value properties could raise up to $1.7 billion per year in Metro Vancouver alone. The NDP also shows no sign of reversing the BC Liberals’ regime of state subsidies for the private mortgage market. Through homeownership grants and tax exemptions for property buyers, the provincial government now subsidizes the real estate market to the tune of about $1.25 billion each year. Homeownership subsidies have become an “engine of inequality” in North America. Instead of questioning the property ownership wisdom, John Horgan has doubled down on it. Throughout the spring, the bulk of the NDP’s housing campaign was focused on speculation and a host of associated terms like “shadow flipping,” “dirty money,” and “market distortion.” Unfortunately for the rest of us, the NDP’s housing critic David Eby is an MLA for one of the richest districts of British Columbia—Point Grey—which also happens to be the NIMBY and property-owner capital of colonial BC. Much of his campaign catered to those who feel “enraged” that practices such as “shadow flipping” brought up the purchasing price of their property from $2.7 to $2.8 million. And while we can make jokes from afar, this discourse actually reflects a dangerous turn towards foreigner scapegoating—something on the rise globally today. This year the NDP ran their campaign on the message of a lesser evil: “vote for us because we’re not the Liberals.” Yet when it comes to housing, it is difficult to determine where the parties truly differ. As monthly evictions become the norm and thousands of properties continue to sit empty, a change of government feels more like a regime change from one party of capital to another. We are reminded every day of the cornerstone of the housing system – unlimited rights of private property ownership on unceded Indigenous land. The desolation of the NDP-Green alliance means that the “rules of the game” remain the same, with power kept in the hands of those who already have it. Posted in Homelessness, Housing, Uncategorized. Bookmark the permalink. David Eby has gone dark on social media regarding housing policy. Looks like these guys pulled a Trudeau/Porportional rep.
On July 18th when John Horgan gets sworn in..maybe a tent city should squat on his land ..we Need a place to call Home!